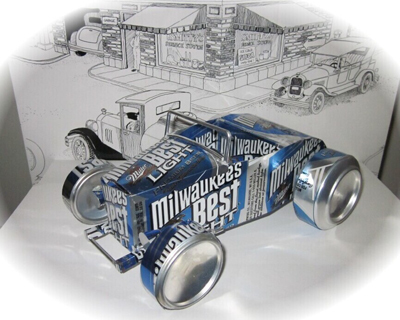 Tesscar Aluminum Craft -- Recycle your favorite beverage can into a work of art! Click on the "PURCHASE" aluminum can for Paypal Single and Multiple ordering information. All plans are sent in Adobe PDF format by e-mail. You can download the Adobe Reader free. 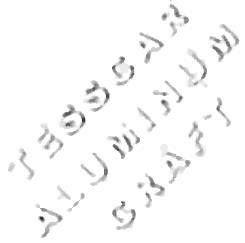 Go to the Tesscar Home page or use the menu on the left to select another model. 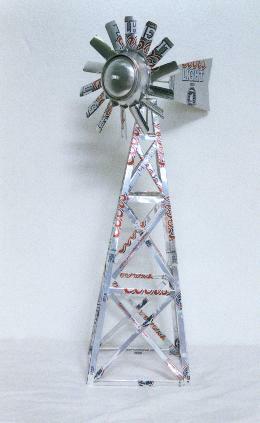 Recycle approximately 13, 12 oz aluminum cans into a work of art with TESSCAR ALUMINUM CRAFT plans. They come complete with full size templates and step by step instructions. 12 pages. To purchase the WINDMILL Model plans, click the Paypal Add To Cart Button. Aviation snips-cutters for aluminum, tin and thin gauge sheet metal. Scissors- 4" long blades, 8" overall. General purpose, straight trimmer. Ruler, Steel- 3/4" x 6" long. (Remove cork backing if equipped) Rulers are used for measuring and as brakes for bending. Protective eyewear. (Safety glasses, goggles or face shield). Hobby Knife-x-acto with pointed blade. (#11) or equivalent. Contact Cement-QuickGrip or Omni-Stick. Available at most craft/hobby stores. Binder spring steel clips-small, 4 required.